A daytime drop in center is an essentialservice in the community. It keeps people out of the heat and out of the cold in the winter. They provide a place for other social service providers to meet with people in need of help. Cosgrove provides a gathering place for holding community meetings. Staff can give some advice to homeless people about where to find housing or a job or a key contact who may be able to solve their issues. A daytime drop-in keeps people from wandering around and getting in trouble. They usually involve the distribution of food and a place to get a shower and shave. They are so valuable for the community, and on Friday we marked the 20th year of the Bishop William Cosgrove Center. I was surprised that there were not a larger number of social service providers and government folks present to help celebrate 20 years of the Cosgrove. On August 22 in the afternoon, staff and volunteers of the Cosgrove Center hosted a Mass at St. Peters and a reception at the Center. I was surprised that every shelter did not send representatives to thank the Cosgrove for helping keep their clients safe during the day. The City, the Police, the local hospitals, United Way, and subsidized housing programs should all thank the Cosgrove for their valuable work keeping people safe. It was a nice service with a few volunteers and current and former clients in attendance. There were current and former staff who celebrated 20 years of service to the community. 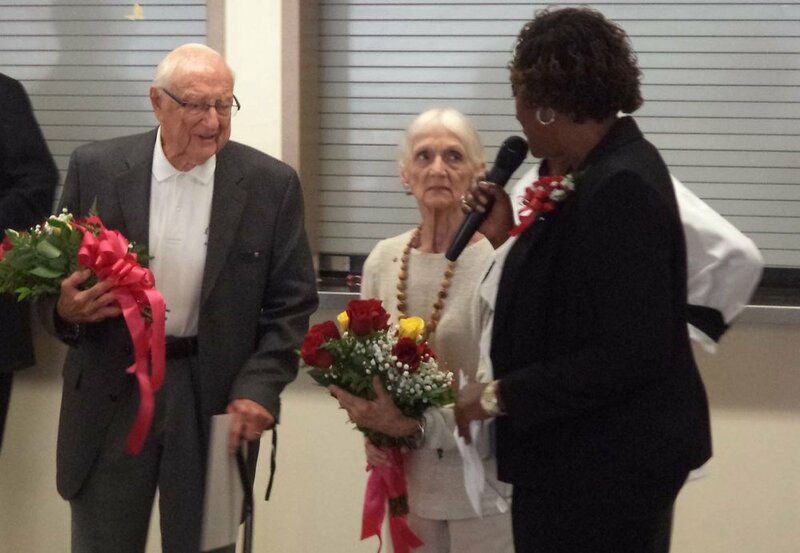 They gave flowers and recognized Bill and Lillian Switaj, two retirees married for 59 years, who help serve the population and pick up bread every week (pictured here with Nicole presenting the couple an award). Bishop Richard Lennon officiated a Mass at St. Peter's church next door and said a few words at the ceremony at the Cosgrove Center. Chef Delk prepared a nice spread of finger food and appetizers for the group. There were a couple of former Erieview Catholic High School graduates who attended to see the converted cafeteria as the 20 year home of the Cosgrove Center. The staff were recognized for serving around 500 meals everyday and providing clothing to hundreds every month. They assist with identification, rent, pantry food, eyeglasses, housing and medical insurance. Partners such as Care Alliance, the Veterans Administration, Homeless Legal Assistance, and the Homeless Congress use the Cosgrove Center on a regular basis. We heard from the head of Catholic Charities, Patrick Gareau who talked about the Cosgrove as the cornerstone of the effort to meet the housing and hunger needs of the community. There was a testimonial from a former guest, Dr. Woods, and Anthony Emery was taking pictures of the event. This was a chance for the Cosgrove staff to thank their many supporters including funders and volunteers. Nearly everyday there are local businesses or church groups in the kitchen helping to prepare the meal or clean up after the food is served. The Cosgrove could not exist without the hundreds of volunteers who keep the program running. They keep the place looking nice and they provide that extra care to the guests who often have no idea where they will lay their head that night. This scared and fragile group who come to the Cosgrove everyday want to see a smiling volunteer or a confident staff member with a strong shoulder to cry on. We recognize the valuable role of the Cosgrove Center in our community and congratulate them on 20 years of helping. Next up in recognizing the work of the Cosgrove Center is the Hand up Gala set for October 17, 2014. You can click on the Hand Up Gala logo on many of the NEOCH website pages to see the details of the celebration.